Colorado Restaurant Coupons – offers Coupons and Discount Deals fopr restaurants and eateries across the beautiful state of Colorado. Adding a Restaurant Coupon to Colorado Restaurant Coupons is an easy and very affordable way to help promote your Colorado Restaurant, Dining Deal, or made in Colorado Product. When you add a Restaurant Coupon listing to the Colorado Restaurant Coupons, your Colorado Restaurant Coupon Ad appears on this website, and also across a network of Colorado promotion websites and social media outlets focused on Colorado communities and the entire state of Colorado. 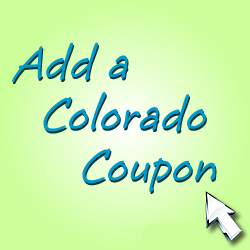 © Colorado Restaurant Coupons All Rights Reserved.